Regular physical activity supports healthy human functioning. Might climate change—by modifying the environmental determinants of human physical activity—alter exercise rates in the future? Here we conduct an empirical investigation of the relationship between meteorological conditions, physical activity and future climate change. Using data on reported participation in recreational physical activity from over 1.9 million US survey respondents between 2002 and 2012, coupled with daily meteorological data, we show that both cold and acutely hot temperatures, as well as precipitation days, reduce physical activity. We combine our historical estimates with output from 21 climate models and project the possible physical activity effects of future climatic changes by 2050 and 2099. 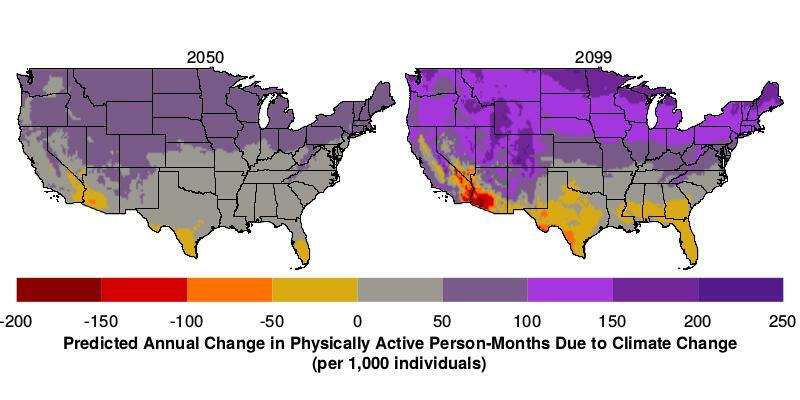 Our projection indicates that warming over the course of this century may increase net recreational physical activity in the United States. Activity may increase most during the winter in northern states and decline most during the summer in southern states.